I bought a box of these Doog Ji Naengmyun on a whim because of the moonshot represented by attempting a Naengmyun in a box. 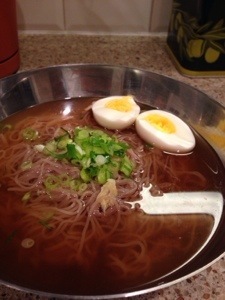 I remember my mother spending whole days rendering the beef broth that forms the backbone of this dish served cold and while it was delicious, it was never as good as the Naengmyun you would get at the restaurants in Seoul that featured the original stuff made by people who fled south during the war. There is a mouth feel to the vermicelli gauge noodles made from sweet potatoes that is somewhere between al dente and rubber band like that is delightful in that hearty stock that is served chilled and vinegared. About two decade or so ago, the frozen refrigerated section of the Korean grocers got the the first of many serial attempts at recreating this, and while they were close enough, they failed in the broth and the noodles were too time sensitive because they were partially hydrated and refrigerated, making it imperative you kept them in boiling water for anywhere from 30 seconds to five minutes. Any longer and you lose that rubbery, al dente feeling. Enter Doong Ji which I tried for breakfast (the boiled egg). 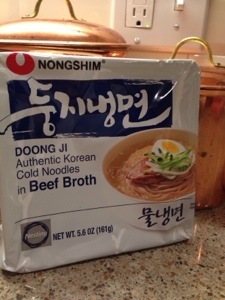 The reconstituted cold broth was initially very salty, dense and had too many competing back flavors that I was dubious. The noodles cooked in their own time, but because they were completely dry to start, they were more reliably done in the recommended 3 minutes if slow boil. I always sample starting from about a minute. When rinsed and in the bowl with the broth reconstitute, the water in the noodles further dilutes the broth and by some strange alchemy, a 95% perfect Naengmyun comes through. The chewiness is perfect. The beef background is there with perfect amount of vinegar. There are some off notes. The dry flakes can be dispensed with. They are freeze dried radish and onions which do nothing for the dish. You are better off chopping green onions. The broth by itself is still un drinkable unlike the best Naengmyun houses in Korea where you would get a mug of the warm broth as a beverage but slurped in with those noodles the flavors are almost there. It is better than a lot of smaller places where it’s a secondary menu offering. It is basically about there with the refrigerated stuff which is saying a lot. It is a solid B when you ignore the broth. Don’t drink the broth.